The energy market has been described as “extremely volatile” as the wholesale cost of energy has contributed to pushing up bills almost 21 per cent on average in five months. Analysis from MoneySuperMarket has revealed that the average price of the top 30 energy tariffs is now £1,042, which is 20.6 per cent (or £178) more expensive than it was in May. The price comparison website fund that there are now only four tariffs available under £1,000 – none of which are fixed tariffs – compared to 89 in April. It said the wholesale energy market has experienced a “substantial upward curve” this year which has had a knock-on effect on the competitive prices many energy providers had previously been able to offer customers. Several suppliers have “been forced to raise their prices” with some of the “big six” including British Gas and Scottish Power having done so twice this year. Challenger supplier Bulb will raise its prices for a third time this year on 11 November. All of Bulb’s customers on its single “Vari-Fair” tariff will see their typical annual bill rise to £1,025, up from £923. Wholesale energy prices were also cited as a contributing factor when Ofgem announced a £47 rise to the level of the prepayment meter cap in August. The regulator also increased the safeguard tariff by £58 in April. 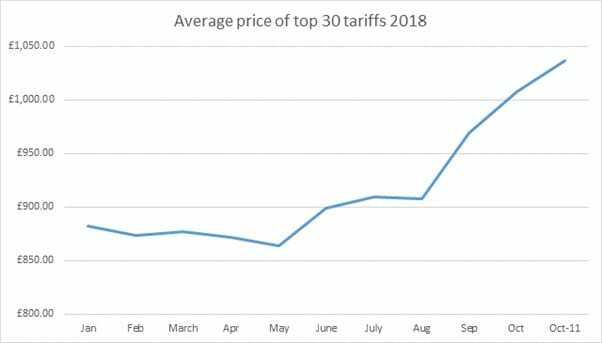 Having hit a 2018 low of £864 at the start of April, the average price of the 30 cheapest tariffs on the market rose to £909 in July, then £969 in September and now stands at £1,042, according to MoneySuperMarket. The current cheapest tariff on the market is a variable priced “100 per cent green” tariff from Pure Planet, with an average annual bill value of £921. The cheapest big six tariff is a one-year fixed deal from British Gas (“Energy Plus Boiler Cover October 2019”) at £1,020, which is £204 cheaper than the big six average annual standard variable tariff, at £1,224. “The wholesale market is one big driver of this trend, but the soon to be introduced energy price cap is another factor at play and for suppliers, it’s the elephant in the room. “While prices are rising and getting closer to the level of the price cap (£1,136), it’s worth noting the latter will not stay at the same level. It will almost definitely rise early next year and customers who sit tight now thinking they will be protected will be sorely disappointed. The price cap is creating an artificial market, which will still have to reflect market conditions at its next update. That means its level could rise anywhere from £100 to £150. Ofgem has proposed to set the energy price cap at £1,136 per year for a typical dual fuel customer paying by direct debit. Some suppliers have said the level will be a cause for concern for the industry. The regulator says 11 million households on poor value default tariffs are set to save around £75 on average, while a typical consumer on the most expensive tariffs would save more than £120, when the cap is due to come into effect in December. Energy UK’s chief executive, Lawrence Slade said: “No one takes the decision to increase prices lightly but wholesale costs – which are out of suppliers’ direct control – have risen by more than 20 per cent this year forcing suppliers across the market to raise tariff levels. This was underlined when Ofgem recently increased its safeguard cap pointing to the rise in wholesale costs.